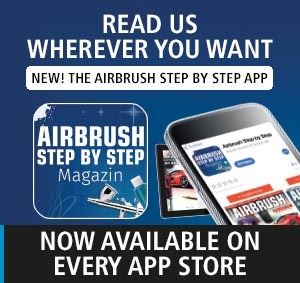 By using the Airbrush Step by Step web site (“Site”) and/or downloading any content, you agree to be bound by and comply with this Site Usage Agreement (“Agreement”). If you do not wish to be bound by this Agreement, do not use this Site. This Agreement applies to every user of this site. 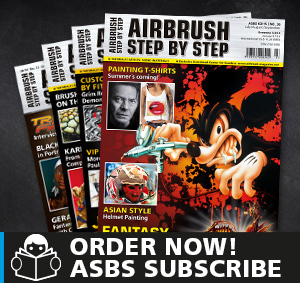 Airbrush Step by Step reserves the right to change this Agreement from time to time at its sole discretion, and your use of the Site will be subject to the most current version posted on the Site at the time of your use. This Site is owned and operated by newart medien & design (“newart”). All images, audio, video and related informational materials in any medium furnished by newart hereunder, including related text, captions, or information (collectively referred to as “Content”), is owned by newart or our licensors and is protected by German copyright laws, trade dress, moral rights, and other intellectual property rights. Except as explicitly permitted under this Agreement, no portion or element of this Site or its Content may be copied or retransmitted via any means and all related rights shall remain the exclusive property of newart. This website consists of an official part and a closed members section. In the open section you have the only right to view any kind of content. With using the website you agree with the legal information and disclaimer showed in the impress of this website. In the members sections you have access to content that you may only use in the following way: You may not remove any copyright or other proprietary notices contained in the Content, caption information, or any other material on this Site. Your use of this Site and any Content shall comply with all applicable law. newart reserves the right, in its sole discretion, to revoke your authorization to view, download and use the Content and information available on the Site at any time and for any reason, with or without notice to you of such revocation, and you agree to immediately discontinue such use upon notice from newart. newart may also restrict or remove Content from the Site for any reason, and you agree to immediately discontinue all use of the Content upon notification from newart. newart may immediately terminate any licenses granted to you without notice if you fail to comply with any provision of this agreement. If a license is terminated, you agree to immediately (i) stop using this Site and the Content and (ii) delete all Content and all copies from all magnetic media and destroy all other copies, or, at newart’s request, return all such copies to newart. Conditioned on your compliance with this Agreement, newart grants you a limited license to download Content consisting of images, audio and video files including headline and subtitles solely for private and exercise use. You may use the Content as draft and sample for your own artworks without commercial intend. You may use the Content solely for your internal evaluation .You may not use images in any final materials distributed within your company or any materials distributed outside of your company or to the public or in any online or other electronic distribution system. Except for this limited, internal testing and sample use, newart grants you no other rights, and you may not copy, distribute, publish, display, sublicense, make available, or otherwise use in any way the comp outside the scope of this Agreement. You agree to indemnify and hold harmless newart and its Content sources, officers, directors, employees, contractors, subsidiaries, joint ventures, licensors and licensees against all claims (including, without limitation, claims by third parties), liability, damages (including punitive damages), judgments, settlements, costs and expenses, including reasonable legal fees and expenses, arising out of or related to (i) Your breach of any terms, conditions or restrictions of this Agreement, (ii) Your use or modification of any Content, or combination of any Content, with any text or other content, (iii) Your failure to obtain from third parties all permissions necessary to use the Content; and (iv) any act or failure to act by you or any of your employees, contractors, employers, agents, clients, principals, or users. NEWART PROVIDES YOU WITH THE SITE AND CONTENT ON AN „AS IS“ AND “AS AVAILABLE” BASIS. EXCEPT FOR ANY LIABILITY WHICH CANNOT BY LAW BE EXCLUDED OR LIMITED, NEITHER NEWART NOR ANY NEWART SUBSIDIARY, SUCCESSOR, PREDECESSOR, PARENT, JOINT VENTURE, AFFILIATE, OFFICER, DIRECTOR, EMPLOYEE, CONTRACTOR, CONTENT SOURCE, LICENSOR OR LICENSEE SHALL BE LIABLE TO YOU OR ANY OTHER THIRD PARTY CLAIMING THROUGH YOU FOR INDIRECT, INCIDENTAL, SPECIAL, PUNITIVE, STATUTORY OR CONSEQUENTIAL DAMAGES ARISING OUT OF, OR RELATING TO, THIS AGREEMENT, CONTENT OR THIS WEB SITE, AND YOUR RIGHTS UNDER ANY PROVISION OF THIS AGREEMENT, INCLUDING, WITHOUT LIMITATION, YOUR USE OR INABILITY TO USE THE CONTENT OR THIS WEB SITE, WHETHER FRAMED AS A BREACH OF WARRANTY OF MERCHANTABILITY, TITLE, NON-INFRINGEMENT, OR FITNESS FOR A PARTICULAR PURPOSE, IN TORT, CONTRACT, FAILURE OF ESSENTIAL PURPOSE, OR OTHERWISE. IN NO EVENT SHALL Newart‘ OR ITS AFFILIATES‘ LIABILITY ARISING OUT OF YOUR USE OF THIS SITE OR INABILITY TO ACCESS THIS SITE OR ANY OF THE CONTENT EXCEED €500. THE FOREGOING EXCLUSIONS AND LIMITATIONS ON REMEDIES AND DAMAGES ARE APPLICABLE NOTWITHSTANDING ANY FAILURE OF ESSENTIAL PURPOSE. As a convenience, our Site may link to other sites that may be of interest to you but are not under newart’s control. These links do not imply endorsement by newart and we are not responsible for the availability of or the content contained in any linked site. Despite our efforts to provide accurate information, this Site may contain technical or other mistakes, inaccuracies or typographical errors. Additionally, this Site and its Content may include historically and culturally important images and text that may contain subjects that reflect the social attitudes and circumstances of a particular time or location. You are solely responsible for determining whether your use of any Content requires the consent of any third party or the license of any additional rights, and you should not rely solely on the information provided by newart. If you are unsure whether additional third-party rights are needed for your use, you are responsible for consulting with competent rights management professionals or legal counsel. No action of newart, other than the express or written waiver or amendment, may be construed as a waiver or amendment of this Agreement. If any provision of this Agreement is found invalid or unenforceable, the remainder of this Agreement shall remain valid and enforceable according to its terms. The parties intend that the provisions of this Agreement be enforced to the fullest extent permitted by applicable law. Accordingly, the parties agree that if any provisions are deemed not enforceable, they shall be deemed modified to the extent necessary to make them enforceable and in such manner as comes closest to the intentions of the parties to this Agreement as is possible.